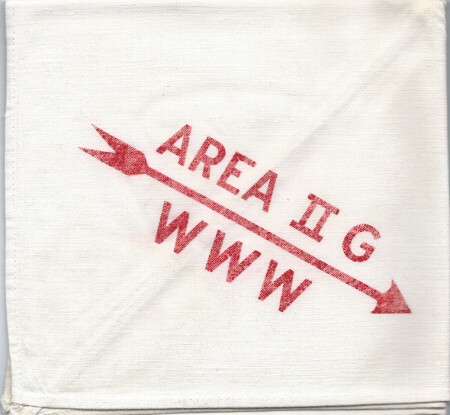 Area 2-G 1956 Conclave Neckerchief? Looking deep into my Inbox, I’ve come across a number of scans from Mark Eddy relating to Central NY and Area 2G and its successors. 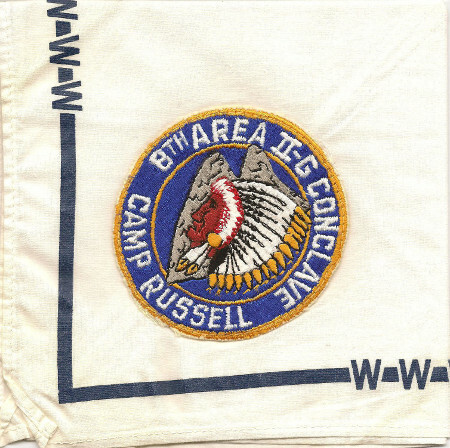 One of the items in the email was an image of what he advises is the 1956 Area 2-G Conclave Neckerchief. HE advises this has been confirmed to him by an old Lodge and Area Chief. The neckerchief looks like it has an error which was likely never corrected. You can see the pocket patch shown below. You can see that this conclave was called the Area 2G Third Conference and the neckerchief is screened with Area 2 & 3 Conference. It looks like the & replaces the G and there is a large gap between the 3 and Conference which could have been intended as 3rd. 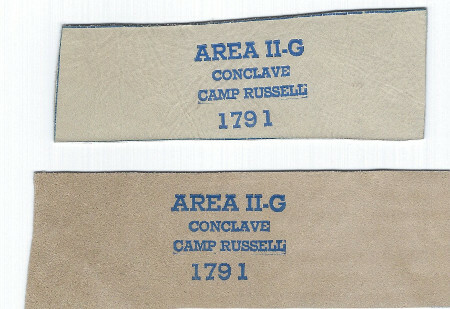 Historically Area 2-G issued a pocket patch and a neckerchief for each conclave during this decade. You can find links to other New York Area Conclave issues on this page. It has been debated on this blog whether the neckerchief shown below was issued for either the 1953 Area 2-G Conclave or for the 1955 Area 2-G Conclave. Mark Eddy looks to put this speculation to rest. He advises that he has confirmed that this neckerchief was issued for the 1955 2-G conclave which was confirmed to him by the contemporary Lodge and Area Chief. I’ll make note of this in both original posts. Mark Eddy sends along a couple of scans of additional color variations and an error version of the Area 2-G 1971 Conclave Leather Neckerchief Slides. It seems likely that scrap leather was used for these, so they may well exist on other colors as well. There is also a 1791 error version. I’ll add these images to the original post. 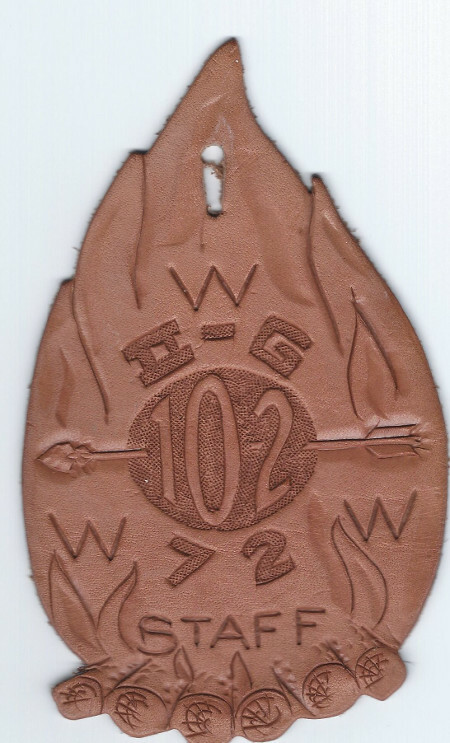 Another image from Mark Eddy, this one is a leather patch from the 1972 Area 2-G Conclave and used as a staff issue. I’ll update the original post with this image as well. In May 2008 I was posting on many Area and Section Conclaves. 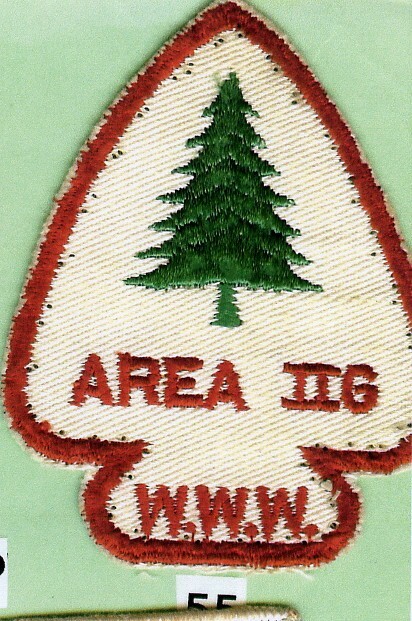 One of them was the Area 2-G Conclave from 1958 which was hosted by Onondaga Lodge #516 and held at Camp Woodland, Constantia, NY. My list of Area conclaves for all New York State lodges is here. Do you have any information for years I’m missing? 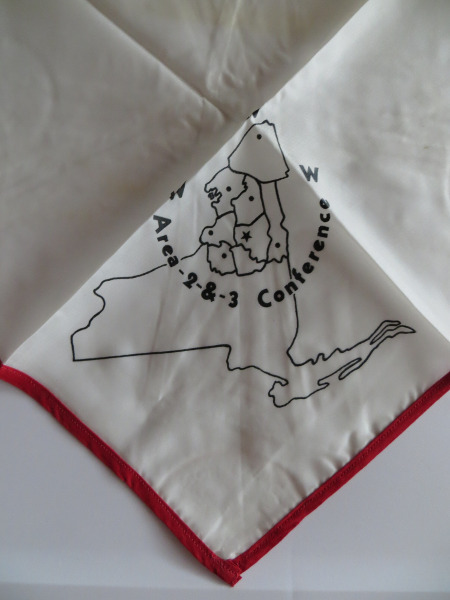 Look Back – Area 2-G 1961 Conclave Staff Neckerchief? 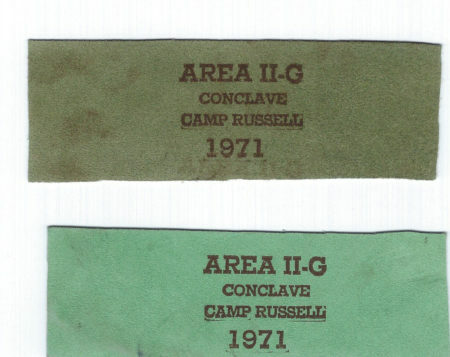 Two years ago in November 2012 we were posting about a possible Area 2-G 1961 Conclave Staff Neckerchief. At the least, the neckerchief diplays a different color silkscreening to the more common version. Area 2-G 1961 Conclave Staff Neckerchief? I don’t know if it is a staff version, does anyone have more information? The original neckerchief I posted has a blue silkscreened arrows and WWW in addition to a larger version of the patch sewn to it. The pocket path is a three inch round. The patch on the neckerchief is almost an oval approximately 3 7/8 inches by 4 1/8 inches tall. This is a need of mine if anyone has one available. 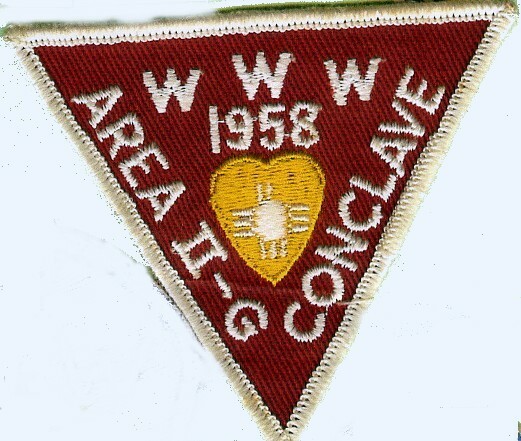 Here is another post from nearly 5 years ago, this time for the 1955 Area 2-G Conclave. Anyone have one of these patches available for trade or sale? 1. Look at the neckerchief, stylistically, it looks very similar to the 1955 patch (which also makes no mention of the conclave or date). 2. 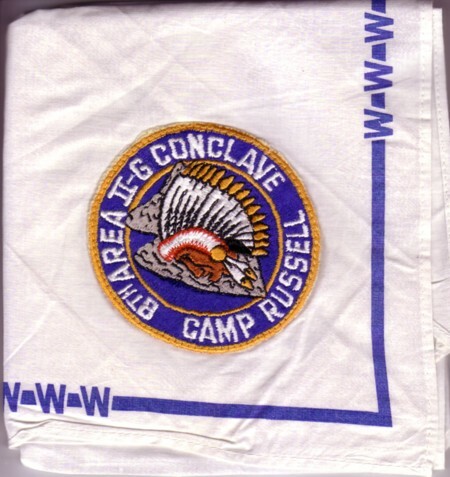 It is more likely that the neckerchief was produced for the 1955 event because a patch was definitely issued (for the 1955 conclave) and was likely paired with it. 3. 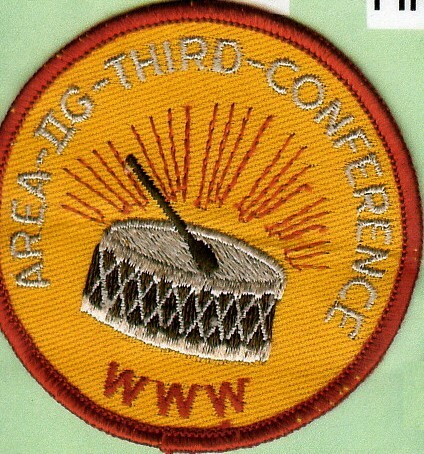 As Bill states, it is possible that nothing was produced for the 1953 meeting (it was probably not a true conclave because the 1956 patch clearly states “Area II-G 3rd Conference”). This implies that the first “true” conclave was 1954 (which has both a neckerchief slide and neckerchief….both clearly dated and stylistically similar). I believe the said 1955 patch was erroneously attributed to this (1954) conclave in the collecting guide (it stylistically looks nothing like the other 1954 pieces). See the original post for the full writeup. This is still a need of mine, does anyone have either the patch available for trade or sale? But just because someone in Team A makes an inadvertent excel error does not mean that everything Team B believes is true. To suggest otherwise would be a truly egregious mistake.